Chicken Thighs … Green Curry, Crispy Chicken Skin and Schmaltz | Cooking is Fun … Really!! I came home with a tray of chicken thighs last week and got to work peeling off the skin, before I began to de-bone them. And then I took a good look at that pile of skin and fat. A quick visit to my desktop, and I came up with a couple of bonus items, from what would have been discarded. 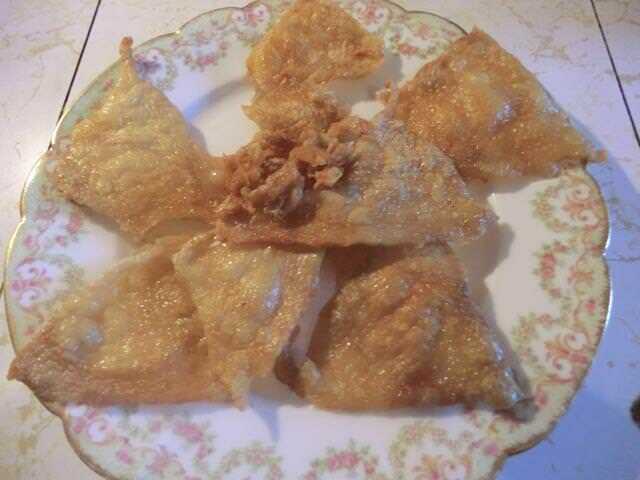 Crispy Chicken Skin … is also known as “chicharron” in Latin America, Spain and parts of the US. And “gribenes” in Jewish cooking. Peel the skin from the thighs. Trim the excess fat from the skin, rinse it, drain and place the fat on the baking sheet. Rinse and pat dry the skin and stretch it out in one layer on the lined baking sheet. Roast, checking every 5 minutes. Drain as rendered fat accumulates. It should take 20-25 minutes to get the skin crispy enough, but you may want to continue for another 5 minutes, if you want a darker colour. Be careful not to burn the skin. Drain the skin on paper towels. 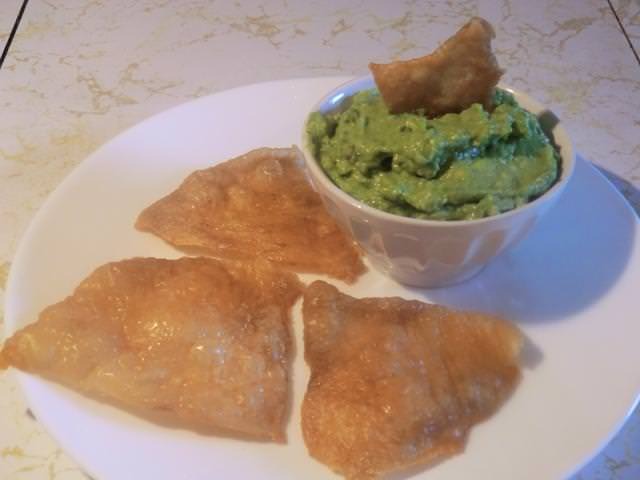 Break into shards and serve with guacamole in place of tortilla chips. Next time, I may chop up the chicken skins and put them in a frying pan over medium heat. After draining off the fat (or schmaltz) as it renders down, I’ll add sliced onions and continue cooking until everything becomes crispy and delicious. They make a great topping to noodle dishes or an ingredient in potato latkes according to readings and advice from a Jewish fellow blogger. Here’s a shot of the entire results from seven chicken thighs. 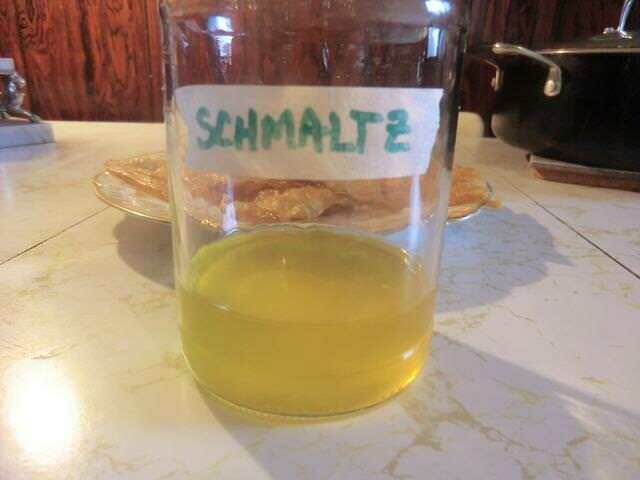 Speaking of Schmaltz … I ended up with about 1/2 a cup of the golden liquid fat which I will use later. 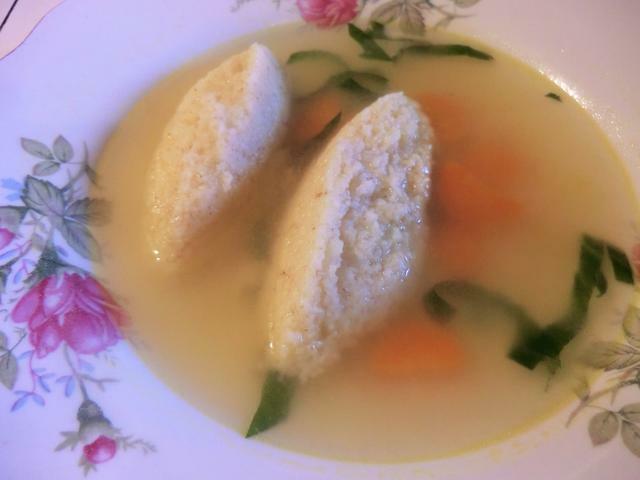 ETA (08/04/2017): Chicken soup with grizgaluska (Hungarian cream of wheat dumplings) made with the schmaltz. Beat the eggs in a small bowl, then stir in the cream of wheat, salt, baking powder and butter. Let rest for 10-15 minutes so the cream of wheat can fully absorb the liquid. Bring a big pot of water to the boil. Season well with salt. You may want to turn the heat down a bit so the water is not boiling furiously as you may break up the dumplings, especially if they’re on the soft side. Dip a soup spoon into the hot water and then scoop out a scant tablespoon or so of the stiff batter and drop it into simmering water. Repeat wetting the spoon as needed to help the batter release cleanly. You want to form a relatively triangular ‘quenelle’ as you scoop. Your dumplings will sink to the bottom as they’re dropped in, so you may want to gently free them in case they stick and don’t float to the top. Once your dumplings are floating, continue cooking for 3-4 minutes. Cut one open to make sure that they’ve cooked through to the center. You’ll be able to tell as they will be yellower and more dense in texture if they’re still a bit raw. Return to the pot and continue cooking for a few more minutes, or as necessary. If you will be adding the dumplings to your pot of chicken soup, you may prefer them a bit ‘al dente’. Otherwise, you can transfer them to a bowl with some of your hot chicken stock and keep them warm until ready to serve. Depending on the size, 2 or 3 will be plenty per serving. 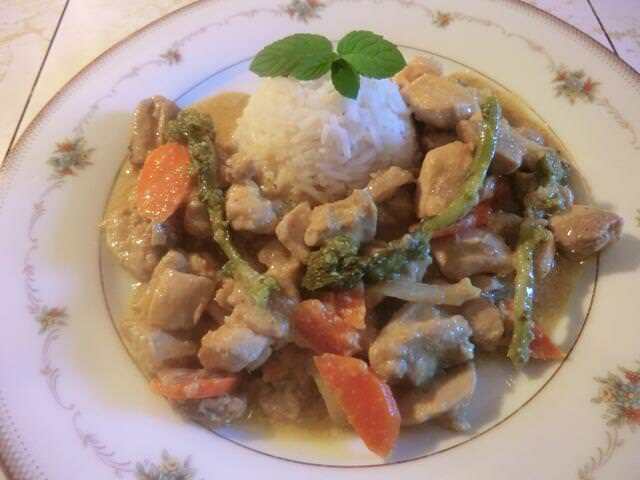 And the main objective of the exercise … Green Curry Yogurt Chicken. It may not be too pretty (my broccoli rabe wilted down a bit too much during cooking) but it was delicious with basmati rice. Jasmine rice is great as well. Great post, great pics, including grizgaluskas (AKA klyotzki)! And rightly so – it’s beautiful. I used to love my Mom’s grizgaluska! Green curry is my favourite of all the Thai curries. We are so wasteful in general it’s wonderful when you can find ways of extending something you would normally discard. Can’t wait to see what you do with the chicken renderings. PS: I just snacked on the ‘renderings’ or cracklings including the skin. Maybe next time I’ll do something more elaborate with them. I’ve been meaning to bake chicken skin for ages…. your skins look so delicious! Thank you for reminding me I must stop throwing away the skin I remove from legs and breast. Great idea to add it as a topping too! Everything looks so good – I am telling my sis (Paleo person) about that chicken skin trick!! Amazing! Fun to read about the cream of wheat dumplings! We used to have cream of wheat all the time when I was a kid, but until today I guess I forgot all about it. Wonderfull!! Those dumplings look like pillowy heaven. Bravo!! Pingback: Pantry/Freezer Clearout – Chocolate Digestive Biscuits | Cooking is Fun … Really! !